Inspired by cult hero RoboCop. Amazingly detailed figures measure 2 3/4-inches and 11-inches tall. 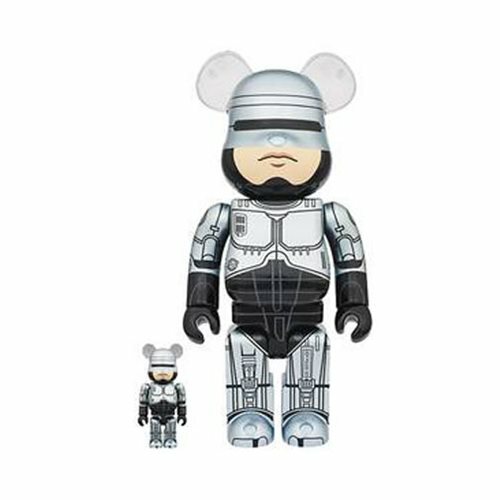 Cult hero RoboCop from the superhero cyberpunk media franchise is immortalized as a bear with this [email protected] release from Medicom Toy! The RoboCop 100% and 400% Bearbrick Figure 2-Pack includes amazingly detailed [email protected] figures in 2 3/4-inch tall (100%) and 11-inch tall (400%) forms. You'd better order yours now. "Thank you for your cooperation. Good night." Ages 15 and up.